The DNR is considering a one-year moratorium on its controversial Earn-A-Buck program. The program, which requires hunters to kill an antlerless deer before they can shoot a buck, has been the focus of many complaints since it was introduced to help control the deer herd and limit the risk of spreading Chronic Wasting Disease. DNR Wildlife Management Director Tom Hauge says the agency has listened carefully to concerns about the requirement, and is recommending the Natural Resources Board adopt a one year moratorium on Earn-A-Buck when it meets later this month. The moratorium would only apply to deer harvested outside of CWD eradication zones. In areas that still have population goals for the deer herd, Hauge says there will likely be extra days of hunting for the purpose of harvesting antlerless deer. 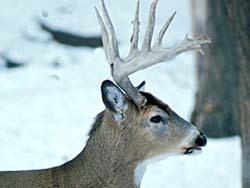 Hauge says the change would only be in place for the 2009 deer hunting season. He says the board would have to revisit the impact of eliminating Earn-A-Buck on population numbers after the season ends. If the change makes it harder to manage the size of Wisconsin&apos;s deer herd, Hauge says the requirement could be put back in place.